Yes people your parents were cool. Check out how totally cool mine were. The Wad is the blonde surfer dude in the middle and the wam is the hot little brunette and check out their pimping VW Combi. It seriously doesn’t get better than this. A friend of my dad’s sent this pic through after they had dinner. 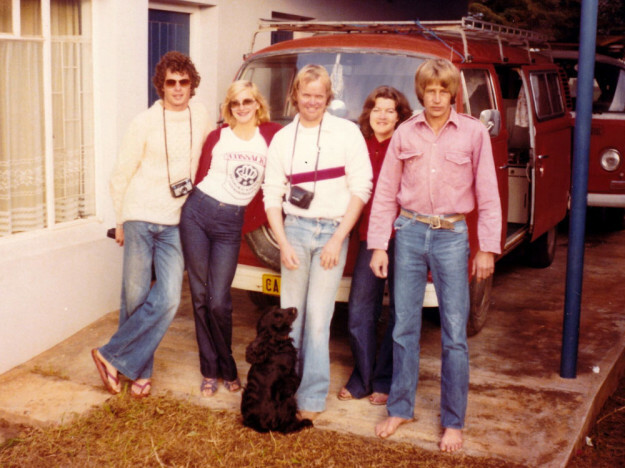 This was the “Original Crew at JBay”, now I’m not entirely sure what that means, but I know one thing is for sure my parents are coooooooool. There are so many things I love about this pic, the wad’s camera casually hanging round his neck (remember those days? Ok I don’t really, but I imagine they were incredibly cool), the bare feet and bell bottom jeans. Not to mention an almost identical pimping combi behind the first one. And lets not even get me started on the look on the dudes face in the pink shirt (I think it’s the 70’s version of Blue Steel). There is something to be said for old school photographs, its something really special. I wonder why this pic was taken, where they were going or what they were doing (I’m sure either the Wam or Wad will provide us with that insight)! What a piece of history! Go out and find a pic of your parents – you just might realise how totally cool they are too! This entry was posted in Play and tagged family history, history, parentals, the wad, the wam.